The Communist Party USA is promoting widespread protests across the United States in support of leftist and labor protesters in Wisconsin. Former Ohio Gov. 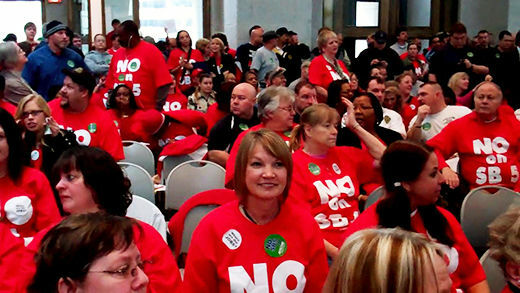 Ted Strickland, the state AFL-CIO and its affiliates have called for a massive turnout for a rally Tuesday at the Statehouse in Columbus to protest a Republican bill to repeal collective bargaining for public employees. In robocalls and emails sent throughout the state, Strickland said "the fate of Ohio's middle class is on the line" and urged people "to join with the thousands who will gather to oppose Senate Bill 5 and the rest of our opponents' backward agenda." The agenda of Gov. John Kasich, who narrowly defeated Strickland in November, includes drastic cuts in health and education programs, abolishing the state's tax on large inheritances, privatizing agencies, such as the turnpike and prisons, curtailing reproductive freedom and restricting rights of immigrants. "The people of Wisconsin are standing up and speaking out," Strickland said. "We must do likewise. We must defend the people of our state." A thousand union members and their allies are sitting in and blocking the entrances to the state Senate chamber here. The demonstrators, singing, playing music and chanting slogans, say they are fighting two anti-union measures that Republicans are seeking to pass in the state legislature. Democrats, taking their lead from their counterparts in Wisconsin, are boycotting the senate proceedings, denying Republicans a quorum required to vote on the "right to work for less" proposals. Texans rallied in front of their state Capitol, Feb. 21, to show solidarity with Wisconsin workers fighting to maintain their union rights. 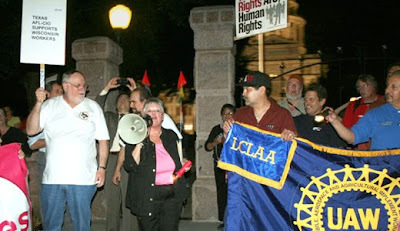 They had marched from the Texas AFL-CIO office in the early evening, led by state AFL-CIO President Becky Moeller and her second in command John Patrick. At least three Democratic state representatives joined her in congratulating the crowd of 500 or so. About 150 of them were union leaders from across the state who were gathering for a legislative conference the next day. The rest were Austinites. All were bursting with enthusiasm for the opportunity to express solidarity with the working people of Wisconsin, who were continuing to grow their numbers and national support. Several speakers lamented the sorry performance of Texas Gov. Rick Perry, a Republican who is head of the National Governors Association and is publicly encouraging right-wingers to support union-busting in Wisconsin. "What's disgusting?" asked the Texas crowd, answering: "Union-busting!" "What's disgusting? Union-busting!" Montanans from Helena and across the state assembled at the State Capitol here on President's Day to reject the ultra-right state legislature's assault on working families. Among what are considered the worst pieces of legislation to be introduced this session are bills to privatize veterans' homes, roll back public employee salaries to 2005 levels, criminalize abortion and prohibit its coverage by insurance plans, cap state employee salaries, slash budgets for the Montana university system, gut state environmental law, repeal incentives for renewable energy - and even declare global climate change to be beneficial for the state. With Republicans in Montana's legislative bodies going to town on the State budget with what the protestor's categorize as reckless abandon, it would be easy to assume that the state was in the midst of a financial crisis. However, Montana has over $350 billion in the bank, a luxury previous governments secured by not deflating surpluses through handouts for the rich. Furthermore, Gov. Brian Schweitzer, a Democrat, has proposed a budget that maintains funding levels for public programs and still allows the government to live within its means. This is not a matter of spontaneous labor protest. This is an orchestrated, nationwide far left challenge to the "Tea Party"/Republican agenda. This is a battle for the future of America. It's all about the children.......BS! Fire them all. So many people are out of work who would probably qualify and be grateful for the work. Contrary to what is being chanted, this is not about "union busting", but about dismantling communism (communism busting). Organized labor (unions) is what communism IS - "workers of the world - unite! "; "dictatorship of the proletariat"; etc. The labor union movemrnt in this country was started by the American communist party, this is the grass roots origin of the DFL party. The DFL "IS" the communist party of America, the labor unions are its spawn. Of course they are protecting their progeny like any "parent". I was at the Tea Party counter-protest in Austin, Texas on Feb 22st. What the reporter doesn't say is the bulk of the Union protesters never came up to the Capitol building where we were. Only 3 or 4 came up to the Capitol steps. The rest stayed several yards away at the Congress Ave entrance shouting and cheering. They also only stayed about 1/2 hour, while we were there for about 2 hours. Y'all are a bunch of spoiled brats, Leave that garbage where it belongs... On foxnews. Have you read the the bill they're trying to pass? It says that in the case of an economic crisis, that the governor has the authority to authorize the emergency manager—this is somebody who would be appointed—to reject, modify or terminate the terms of an existing contract or collective bargaining agreement, authorize the emergency manager for a municipal government—OK, so we’re not—we’re talking about towns, municipalities across the state—to disincorporate. So, an appointed official with the ability to dissolve an ELECTED body, when they want to. Is that democratic or America? Did you know that the civil rights movement was also backed and funded in part by the communist party USA? So is racial equality also communism...? In communism the goal is to over throw the rich and powerful, take they're wealth and put it in tha hands of the people who's backs that wealth was built on. We don't want that, let them keep they're wealth, we just want equality. The writer of this blog has no contact with reality. I would not be surprised if "communists" would support the protesters in Wisconsin, but I haven't seen any evidence of an organized communist group in Wisconsin since the '70s. While I know several people who might describe themselves as socialist, no one with a brain would subscribe to communism. History has shown that it just doesn't work. The people who have risen to protect unions are those who belong to the unions. Many are Democrats, many independents, a few are Republicans, and yes a handful of socialists, but sorry no communists here.